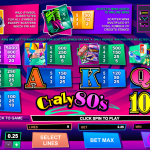 Crazy 80s is a video slot game from Microgaming that revolves around one of the best decades ever. Some say that we cannot give a definition what the 80s were exactly about, but we must admit that it was a decade where lots of changes happened like technological advancements for instance. So let’s dive deep in the past and see what Crazy 80s is all about. All of you that were born in the 80s probably want to step back in time and see what the era was all about. To be honest you probably do not have many memories of your earliest childhood. We have a game that is as simple as the 80s. There is nothing much going on in the special features department per se. This is one simple game and the accent is put on that simplicity for a reason. We have 2 special symbols here that can make a slight change to your game play but do not expect much. There is a wild which is the ghetto blaster symbol and it substitutes every other symbol except for the scatter. Then we have the scatter which is the ankle warmer and it offers scatter payouts only, it does not activate any feature. 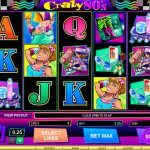 Microgaming did a great job with Crazy 80s video slot game. They have created a simple slot that is a throwback to an era that brought many changes and advancements. 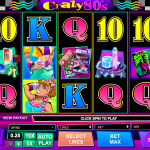 Playing this slot is so easy that at times you will forget that you are playing for real money. And the best part are the wins, they are small but steady and will allow you to play the game longer. Another great slots game would be Crazy Chameleons a 5 reel slot by MicroGaming.